Got the Microsoft Surface Book this morning, and have been fairly impressed so far with this new device. After playing some games, streaming my Xbox-One, and doing some work on it, I am really liking the specs of both the full unit and the detached tablet. Here’s a video I made of this happening. Maybe this is expected behavior, but I feel like 1 second is not enough time to bring both hands up to gently remove the tablet. This wouldn’t be so bad, if it weren’t for my second problem…. And there you have it. I’m hoping I just got a rare defective unit – please comment below if you’re seeing this error as well. I’ll be heading to the Microsoft store tomorrow morning to see what they say. My online support experience today with Microsoft has been an absolute disaster on their part… but that’s a post for another day. Update: Yes, I’ve installed the day 1 windows updates – it was the first thing that happened out of the box. And yes, I’ve been rebooting / shutting down to no avail. 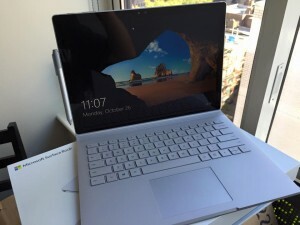 This entry was posted in Computers, Surface Book, Technical Support and tagged surface book on October 26, 2015 by David. Tell me how it goes! I am having exact same problem. Will do – As soon as I can carve out some time tonight I am going to run it up to the MS Store to see what they think. Yeah, I’m waiting to see if the coming Microsoft update fixes any of this before I deal with an exchange.. Both of these issues were resolved not with the day 1 patch, but from updates between then and now. The release still seems a bit wonky but the second issue (the re-attach issue) no longer happens. I had the exact same thing going on… I held onto it thinking/hoping one of the firmware updates would fix things, but no such luck. I would highly suggest just swapping it out at a Microsoft store. I went into the NYC store and told them what was happening, and they didn’t even look at it- just swapped it out with a brand new device. i got the same problem, only happen on the sleep mode. it will pop-up when i week up the surface, but the Detach function is normal…..nothing error….